New! 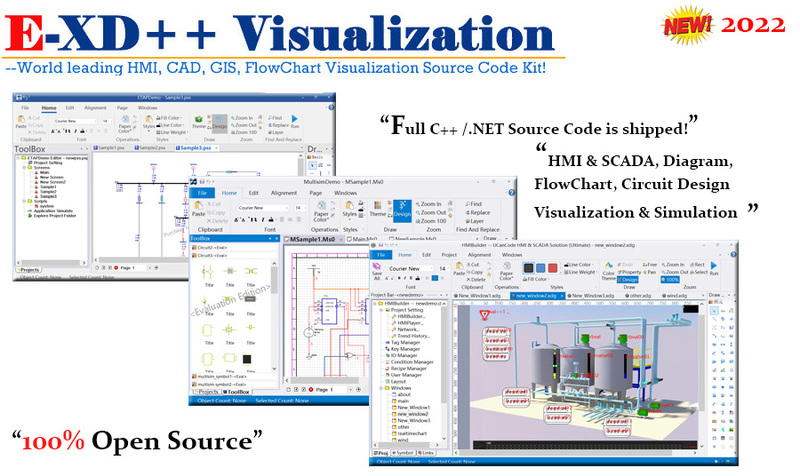 HMI & SCADA, CAD, UML, GIS, BPMN, Label Print, Dynamic Graphics... Data Visualization Source Code ToolKit for C/C++ and .NET Programmers and Developers! "UCanCode Software is a Market Leading provider of HMI & SCADA, CAD, UML, GIS, Vector Graphics and Real Time Data Visualization Graphics Source Code Kits for C/C++ and .NET software developers more than 40 countries around the world!" 02/2019, E-XD++ Visualization Enterprise Suite V2019 Volume 1 is ready, this is a maintenance release that includes improved drawing performance, drawing speed, full compatible with Visual Studio.NET 2017 and Windows 64 bits, tons of new features, bug fixes and more, it ships with new updated HMI &SCADA, GIS, UML, CAD, BPMN, SVG Solutions. More at here. HMI & SCADA Real - Time Dynamic Graphics Visualization C/C++ and .NET Source Code Solution 2019 is ready! E-XD++ IEC-61131 PLC Automation Programming Visualization Source Code Kit 2019 for C/C++, .NET is ready! MATLAB Simulation Visualization Solution 2019 is ready! ETAP Electrical Power Simulation Solution 2019! All the C/C++ and .NET source codes of the following solutions will be shipped with full edition, truly HMI and Vector Graphics Source Code solutions! The world's leading enterprise-class CAD drawings and printing graphics source code toolkit, 100% VC++/MFC based, all the complete source code is shipped, it supports importing and exporting AutoCAD DXF and SVG file. CAD OCX control's source code can be used in other non-VC + + environment. It is the "Must-Purchase" source code graphics library for building any CAD Applications, it will saves you a lot of development time. E-XD++ GIS solutions provide a desktop GIS editing environment, support for image digitization, it can directly import ArcGIS map data file, and to provide developed GisViewer and Web Gis the OCX control source code, it is the "Must - Purchase" source code library for the development of GIS geographic information system , it can saves you a lot of development time. E-XD++ Business processes, Workflow and BPMN flow chart visualization source code for C/C++ and .NET, you can easily create a very professional business process diagrams. The world's leading electronic forms visualization Solution will help you to complete Electronic Forms design. A Electronic form filler is shipped for form reading and filling. All the complete source codes will be shipped, without any reservations. E-XD++ Report designing and printing Visualization Source Code Kit that supports a very wide range of ODBC data source to automatically take the data from the database, and supports more than 20 kinds of 1D and 2D barcode printing. All of these parts source codes will be shipped, and it is 100% VC++ / MFC based , all the complete VC++ Source Codes will be shipped, it can saves you a lot of development time. Provide professional architectural component design source code kit (100% Visual C++/MFC based), complete annotation and layer functions can automatically identify thousands of printing equipment, do not care about the printer settings, it can be automatically paged print or scaled print, etc., 100% of the full source code is provided without any reservation!. The best VC++ Source Code Extension Kit for building very professional Circuit design and Simulation Applications. The pins of professional circuit elements can be created, process and automatically processing support scaling, all these features supports Undo / Redo, all 100% VC++ source code provided with the full edition, without any reservation. Provide dozens of professional instrumentation gauge / dashboard components, and all instruments, including pointer, scale, background, etc. all these components are designed from start to be full customized, all 100% VC++ source code with the full edition, without any reservation. It is the best choice for building any real time software. This solution provides multi-page editing of Microsoft Visio-like flowchart design, print preview feature, and it can import and export SVG vector exchange graphics files. All 100% VC + + source code will be provided with the official version, without any reservations. This solution provides the source code of professional UML design for C/C++, .NET developers, C + + header files can be automatically read and display the relevant information. All 100% VC + + source code will be provided with the official version, without any reservations. SkinMagic Toolkit V2.40! SkinMagic is a powerful library that changes the appearance of windows or dialogs, providing developers with full-featured support for 'application skins'. UCanCode Consulting Services offer a full range of services to help you implement your Visualization requirements. Copyright ?1998-20019 UCanCode.Net Software , all rights reserved.